This is Lucy, she’s a rescue Asian Eagle Owl who came to us for microchipping. She was rescued by her owners and it took them 5 weeks to gain her trust. 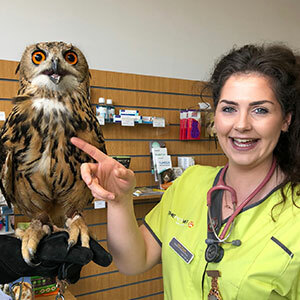 She is now the most friendly owl who lets you stroke her, she flys for you and loves a good picture with our nurse Izzy.